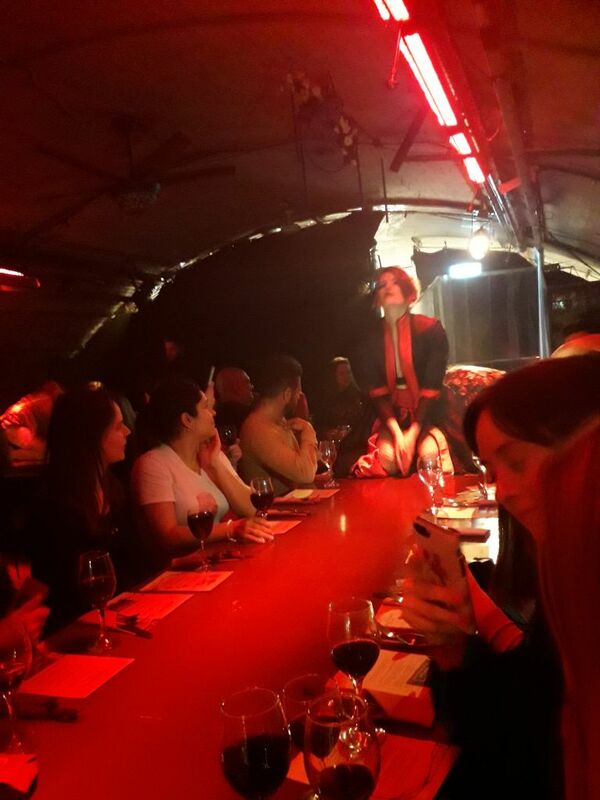 What a fun and slightly dystopian evening to be had at the Vaults in Waterloo with part-art, part-fine dining night club. Coming in from a graffiti-daubed passageway under the station you enter a world where the artist is mistress. 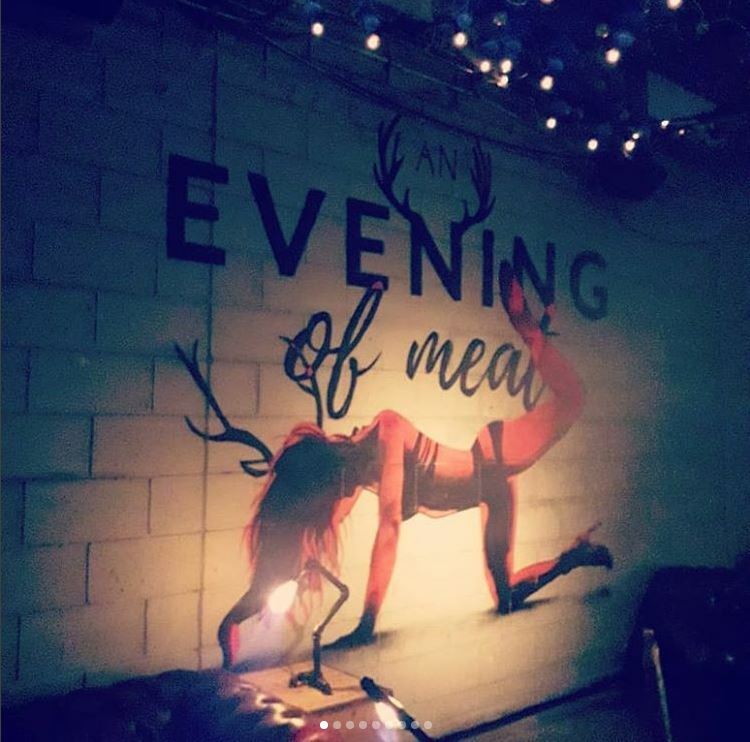 Installations of steely female figures are set off against a painted backdrop of a horned, long-haired woman on all fours about to rear up in, hopefully, dance. Director Kate March and her all-female creative collective, I AM, have brought An Evening Of Meat — previously performed in Berlin, Sydney and Hong Kong — to London. 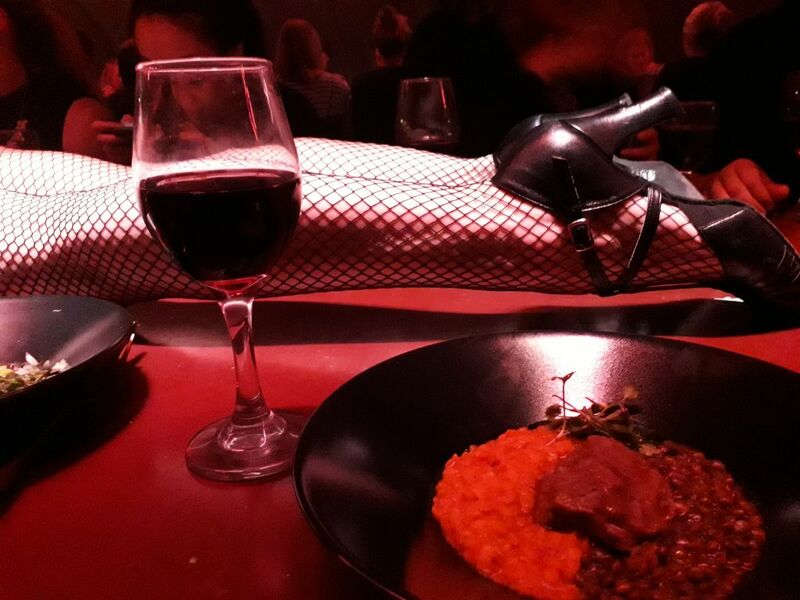 Inside the deeply red, corrugated-lined dining room, blaring with 80s and synth pop take your seat at a communal table laid simply with a menu, wine glass, cutlery and a prostate human shape. Canapes come as a savoury cone with chicken liver, with a rather nice bottle of red wine. The beats pump up and conversation is futile as the female shapes assert themselves in your space and later in your face. It’s a rather good six-course dinner with beef carpaccio with a Thai twist, a juicy mutton on peas with a sweet tinge of black garlic and crumbly dehydrated feta. Pig cheek in a ‘Yin and Yang’ combination of bright orange and slate-green lentils was melt-in-the mouth delicious. Surprisingly there were a lot of vegan and vegetarian options that also sounded good. 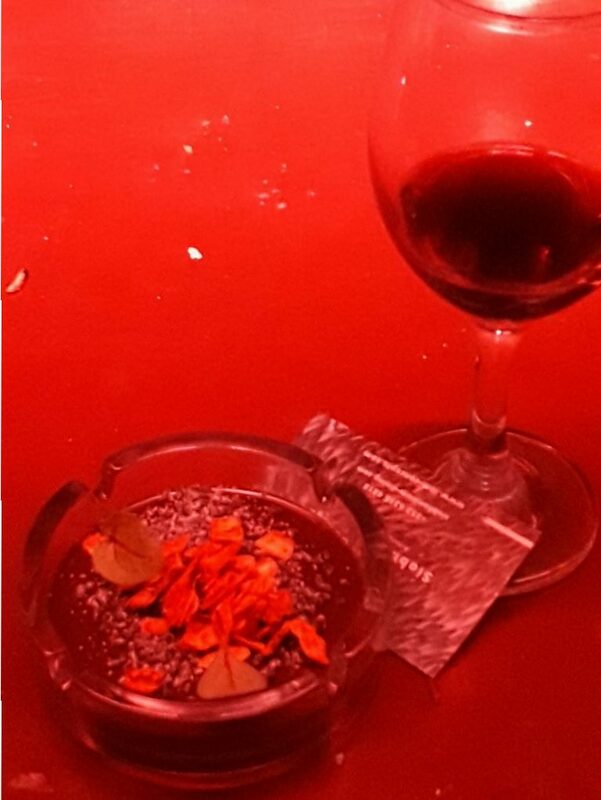 The dessert of chocolate ganache, smoked salt and sesame ash was served in an actual ashtray. 70% Guanaja chocolate and olive oil ganache, sesame ash, coconut bacon flakes and vanilla smoked salt! Not for the faint-hearted, there’s a lot of table thumping and a constant drawing your glass out-of-the-way as the entertainers prowl the room and tables, dropping off bits of clothing and watering the diners from aloft. It’s loud, provocative but it’s fun – sparking every single one of your senses and stunningly getting the point across that women are not pieces of meat. Book here – I’d recommend it!